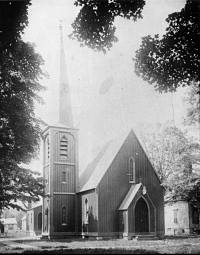 Trinity Episcopal Church in Warsaw, NY was organized and incorporated May 12, 1852. 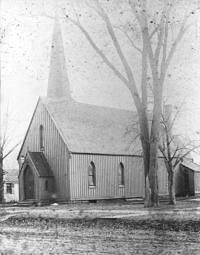 The Church was built in 1853. The new building was consecrated on May 25, 1854 by the Right Reverend William Heathcote DeLancey, First Bishop of Western New York. Trinity follows the plan and elevations of the design published by Richard Upjohn (1802-1878) in ‘Upjohn’s rural architecture: Designs, working drawings and specifications for a wooden church, and other rural structures’ (1852). It represents one of the best examples of the rural gothic ecclesiastical architecture. It is considered a “complete illustration” of Upjohn’s work. This frame board and batten church has tall lancet windows and pointed arch portals. Nave and chancel windows utilize stained glass windows of a type produced around 1870 using stenciling and painted stained glass. The original structure was modified between 1870 and 1885 by adding the chancel, vestry, office and vestibule. In 1925 the stuccoed parish house was added. Trinity Church was listed on the National Register of Historical Places on March 18, 1980. In 2016, Trinity’s building had emergency surgery – our beloved belltower was razed to the ceiling of the first floor, and our bell was gently placed in the barn behind our sanctuary. The work on Trinity’s building has not yet finished, and when it is, our bell may yet ring again. 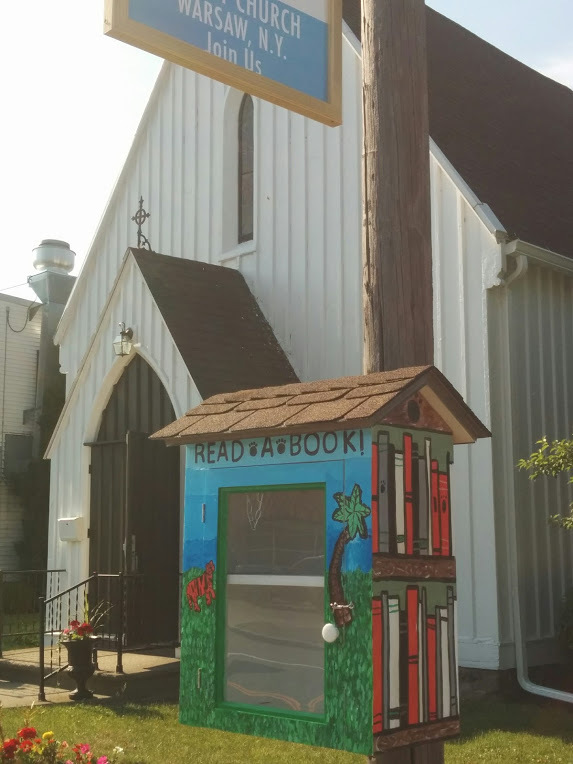 The parish is in the midst of a capital campaign, and all checks in support of the capital campaign may be made payable to ‘Trinity Episcopal Church’ with ‘capital campaign’ in the memo line, and sent to PO Box 396, Warsaw, NY 14569. We’re grateful for all of your help!